Arguably the most important position in sports, a goalie can steal a game or playoff series. A goalie can also break the hearts of loyal fans and cost a coach their job. An NHL goalie is the ultimate last line of defense. There has been a lot of talk about the Dallas Stars goaltending over the past few seasons. And today we review the Top Three All-Time Goalies in Dallas Stars’ franchise history. A few qualifiers before we move forward with the All-Time Top Three. First, “All-Time” means we will also consider former Minnesota North Stars goaltenders. Next, all statistics or relevant performance criteria will be based solely on their time with either the Stars or North Stars. Lastly, the goalies must have played in at least one hundred games with Dallas or the Minnesota North Stars. Ed Belfour is the clear choice for number one on the list. The Stars signed Belfour as a free agent on July 2, 1997. Belfour was coming off a poor half-season with the San Jose Sharks but had built an impressive resume with the Chicago Blackhawks from 1988 to 1997. He won the Calder Memorial Trophy for outstanding play as a rookie and was twice recognized as the NHL’s best goalie winning the Vezina Trophy in 1990-91 and 1992-93. Belfour’s outstanding play in the 1999 playoffs was a catalyst to the only Stanley Cup championship in Dallas Stars history. He also followed that up by bringing the Stars within one game of back-to-back Stanley Cup championships. He was inducted into the Hockey Hall of Fame in 2011. Belfour is second in franchise history with 27 shutouts and had a .910 save percentage in 306 games with Dallas. His 44 playoff wins, 1.84 playoffs goals against average and stingy .926 playoffs save percentage all rank first in Stars franchise history. Dallas selected Marty Turco in the fifth round (124th overall) of the 1994 NHL Draft. 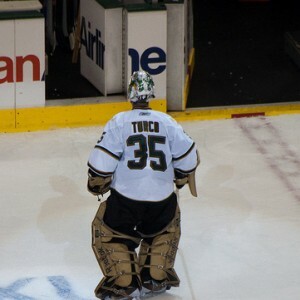 Turco spent the next four years playing for the University of Michigan. Once his collegiate career was over, he spent the next two seasons developing his game in the minor leagues with the Michigan K-Wings of the now defunct International Hockey League (IHL). The following season Turco made the NHL roster as Ed Belfour’s backup. The arrival of a young Marty Turco meant time was running out for the older and more expensive Belfour. After the 2001-02 season, Dallas chose not to re-sign Belfour and gave the job to Turco. In 2002-03 Turco was outstanding and finished second to Martin Brodeur in Vezina Trophy voting. His 509 career games are first among franchise goaltenders. Turco also ranks first in franchise history with 40 shutouts and 262 wins. His 21 playoff wins, 2.17 playoffs goals-against average and .914 playoffs save percentage are second to Belfour. Cesare Maniago made his NHL debut in 1960-61 with the Toronto Maple Leafs. He played in seven games (4-2-1) for the Leafs that season. The NHL was still in the Original Six era at that time. During the next six seasons, Maniago struggled to find a starting job and made appearances with the Montreal Canadiens and New York Rangers in between several minor league stops. Maniago’s big break came in 1967-68 when he was the first expansion draft choice of the newly anointed Minnesota North Stars franchise. Maniago’s play led the North Stars to their first playoff appearance. He led Minnesota to the playoffs in five of his first six seasons. After nine seasons with Minnesota, Maniago finished his career in Vancouver where he was a backup for two seasons. Maniago has the most career regular season wins (144) and shutouts (26) in North Stars history. Current Dallas Goaltender Kari Lehtonen leads the list of runner-ups. His 193 regular season wins trail only Turco. Also, his .913 regular season save percentage ranks first. Unfortunately, in 17 playoff games, his save percentage is a leaky .893. Also, during his career in Dallas Lehtonen has only received one third-place Vezina vote (2013-14). Jon Casey and Gilles Meloche helped Minnesota reach the Stanley Cup Finals (1990-91 and 1980-81), and their 21 playoff wins ties Turco for second in franchise history. Don Beaupre, another goalie from that era, tied for fifth with Kelly Hrudey in Vezina voting in 1985-86. Lastly, Hockey Legends Lorne “Gump” Worsley and Andy Moog wrapped up their distinguished careers playing for the North Stars and Stars, respectively. Worsley’s 2.62 regular season goals against average ranks first in North Stars history. Meanwhile, Moog had 75 regular season wins with the Dallas Stars.